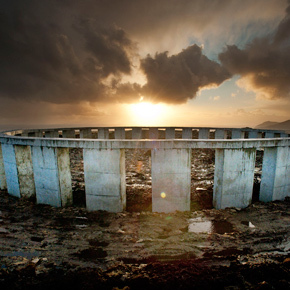 Achill man Joe McNamara has today been ordered by the High Court to take down his controversial Achill-henge structure pending an An Bord Pleanála ruling on whether the structure should be exempt from planning permission. The structure, built by McNamara over the course of one weekend last November on a hilltop on Pollagh on Achill Island, had no planning permission. Mayo County Council, which wants McNamara to remove the structure, had taken the case to the High Court. McNamara, through his counsel, argued that the structure should be exempt from planning permission, as it is ‘an ornamental garden’. There has been much speculation about the purpose of the concrete structure, which is four-and-a-half metres high and almost 100 metres in circumference. McNamara previously described it as a ‘place for reflection’ in court, and sources close to him have hinted that it is ‘a tomb to the Celtic Tiger’. McNamara, a former property developer, was also behind a series of high-profile protests against Anglo-Irish Bank, including driving a cement truck daubed with the words ‘Toxic Bank’ at the gates of Leinster House. His protests earned him the moniker ‘The Anglo Avenger’. McNamara has also applied to An Bord Pleanála to have the structure considered exempt from planning after Mayo County Council refused an initial application in that regard. That hearing will be heard in May. Locals in Achill have speculated that it is ‘unlikely’ that McNamara will take the structure down.